Perhaps this is a controversial view, but I have a dedicated aversion to the word very. This quote made me laugh until I read some of my own work with this in mind and then I realized what a great suggestion it truly was. 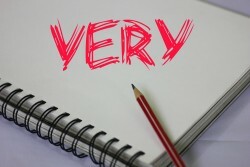 It’s rather mind boggling, even as a self-professed professional writer, how many times I use the word very. When we write we are trying to woo women (and men) through our words. We want them to like the stories we’ve written. And using the word ‘very’ is just downright lazy and needs to (mostly) be stricken from your vocabulary. Speaking of vocabulary, it’s a great time to enhance yours so that you will have words that will convey what you mean without using that oft dreaded word. Here is a list of words (on the left) that we tend to put the word very in front of. Instead, the word on the right is another powerful way to say what you mean without the lackadaisical word very in it. If you’d like some other words, check out Word Hippo, it is such a great site and it has a killer thesaurus for a plethora of words. That doesn’t mean you will never again use the word ‘very’ it’s just a reminder to be very sure (sorry, I couldn’t help myself) or better yet, confident that it is necessary.